IBM Researchers have built an optical chip that can transfer more data per second than pretty much anything else on the planet. They call this transceiver the Holey Optochip - holey because they've taken a chip wafer and fired 48 holes in it so that laser light can be blasted in and out of the chip, moving data at one trillion bits per second. That's eight times faster than the fastest comparable optical components on the market today, and about 10,000 times faster than the 100 Mb/second Ethernet that's still common on corporate networks. It doesn't use much power either - just under five watts. That's a big issue in today's data centers and supercomputer installations. IBM doesn't plan to turn the Holey Optochip into a product, but they would like it if someone in the transceiver business licensed their technology to build super-fast networking technology for high-performance computers. The chip is built out of commodity components - the chip's hole-riddled design is the breakthrough here, not any individual component - so this is something that could happen within the next few years, says Clint Schow a group manager at IBM Research. "This is basically just a higher bandwidth version of those links today that are used in high-performance computers," he says. "The trick is we package it very well so we can deliver on the bandwidth and power simultaneously." Networking bottlenecks are becoming a real problem as computer-makers cram more and more powerful processors into massive supercomputing system. It's becoming tricky to get all these chips talking to one-another in an efficient way, so they're not spending too much of their time just waiting for an answer from some other part of the machine. As supercomputers become used for more and more types of programming, predicting how the network will be used becomes even harder. Seeing these problems ahead, Schow and his team set off to find a way to get to this one trillion bits per second (a terabit) networking about five years ago. "The network's becoming the real problem that's limiting everything," Schow says. 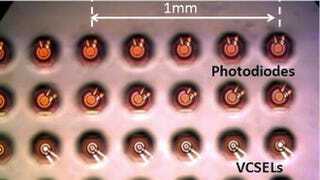 IBM researchers will discuss the Holey Optochip Thursday at the Optical Fiber Communication Conference in Los Angeles.